To have tailor made wedding dresses will be costly at this time of the year. People choose year end to have their wedding as most relatives and kids will be on vacations. This is the time where everyone is able to attend weddings. Modern brides would prefer to order online for wedding dresses as it is much much cheaper than having their wedding dresses tailored made. 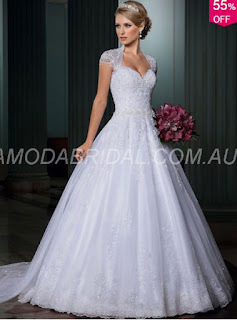 I know of one online shop that has a wide range of beautiful and cheap wedding dresses from amodabridal . During my time, I have to have my wedding dress tailored made and it really cost a bomb. Now modern brides can just click away to shop from the screen in front of them. So convenient and cheap especially now they have great offers on. Do check it out at http://www.amodabridal.com.au and have your dream wedding dress !